GetResponse is an integrated online marketing platform that features high-performing tools, including: email marketing, landing pages, marketing automation, webinars, and more. Many integrations with e-commerce, analytical, and CRM services are available. 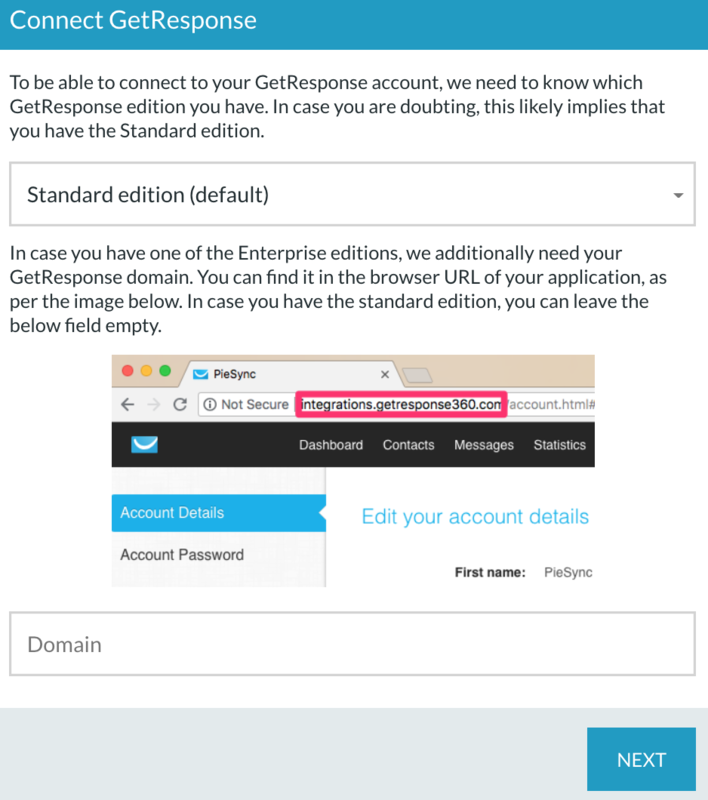 To authorize, select your GetResponse edition and if applicable (= Enterprise edition), fill in your domain name. We need permission to access both your accounts, this is necessary to keep your accounts in sync. To Authorize your GetResponse account, we need you to allow access to your account. If you’re not logged into your GetResponse, we’ll ask you to do so first. During this step, you’ll need to determine which GetResponse Campaign you want to keep in sync in this connection. You can sync one campaign per connection. If you already authorized your GetResponse account(s) in the past or in any other PieSync integration, you'll be able to skip this step and choose from your CONNECTED ACCOUNTS. By default, you will not see many fields that have been mapped, like for instance the Name & Email with a Hubspot connection. These are mapped by default - you cannot change these. See below an example, showing a connection with Pipedrive. PieSync syncs the default name field(s) that come with the apps. Sometimes they have a different structure in both apps you connect. E.g. first and last names are separate in app A (Hubspot) and joint in a single field in app B (GetResponse). In the background, PieSync joins first and last names together from app A to B and separates them again from app B to A. Our algorithm is smart about which part it updates in app B. Because the default fields in GetResponse are scarse, you can and should custom map your GetResponse custom fields and any additional standard fields that aren't included in the default mapping yet. Bear in mind a mapping between two fields can only exist if the types of fields are compatible. More information on Customizable Field Mapping here. For the time being, our unsubscribes/deletions sync is not supported for GetResponse. The availability of the feature to subscribe or sync deletions is app and connection dependent. We need to be able to detect deletions or unsubscribes on one side and at the same time be able to create a new segment 'PieSync Trash' or 'PieSync unsubscribe' on the other side. More information on syncing deletions with other integrations, or on syncing unsubscribes.